The Lugdunum Roller Contest offers competitions in roller, skate, and scooter for pros and beginners. The 2018 Lugdunum Roller Contest kicks off with a free “Randonnée Roller” on Friday, September 21 and ends with a bang on Sunday with the Coupe de France des Marathons Roller. Held at Place Bellecour, the “Randonnée Roller” begins the festivities at 8:30 p.m. on Friday, with a 23km loop suitable for all. Over the course of the weekend, test your skills with competitions for pros, beginners, adults and kids. Included is a relaxed family course, a Course des Gônes for kids, a 21km course for amateur athletes, and the 42km marathon for pros. This year’s contest also hosts the World Skate Cross Series, with two qualification runs and a finale in the afternoon. Meanwhile, the World Slalom Series is returning with classic and speed slalom. 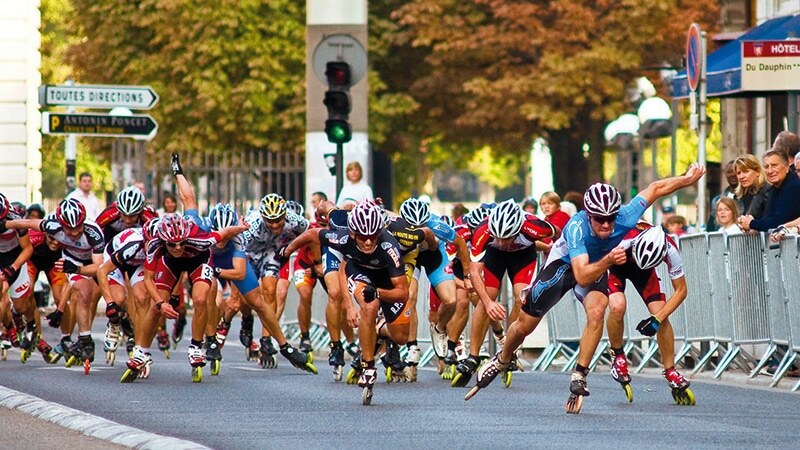 The contest culminates in the Grande Fête du Roller on Saturday afternoon and all day Sunday, with rollerblading intro sessions and activities in all disciplines (roller hockey, scooter, and skating). The Grande Fête also includes a kids’ TrottiRace scooter course. All races are held on Sunday, with the big Coupe de France marathon kicking off at 3:30 p.m. All activities start in Place Bellecour in Lyon 2. The World Skate Cross Series offers prize money up to €250, up to €50 for slalom, and up to €500 for the roller marathon.